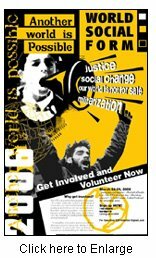 Local print media gave front-page coverage to the WSF — both international campaigns, but also the specific national struggles. Radical writer and activist Tariq Ali, Jamal Jumma from the campaign against the apartheid wall in Palestine, as well as leaders of the Kashmiri independence struggle and the workers’ and peasants’ struggles were all given coverage. The relationship between India and Pakistan and the US government’s manoeuvres, the imperialist wars and occupation of Iraq and Afghanistan and the Cuban and Venezuelan alternatives to neoliberalism were major discussion points. While a Cuban delegation attended, unfortunately no-one from Venezuela was able to, although the social and economic advances in that country were often mentioned. The LPP’s left party initiative — the People’s Democratic Movement — allowed it and its affiliates to host broader left forums, some of which ended up being the largest in a very competitive environment. Of the seven LPP-initiated forums, the most popular were “Political Islam, challenges and responses” with Tariq Ali and Jamal Jumma, which 1000 people attended; “Women Workers in Pakistan — the struggle for change”, hosted by Women workers’ Help Line; “Globalisation and anti-globalisation”, hosted by the Labour Education Foundation and featuring Pierre Rousset of Europe in Solidarity Without Borders and Assim Sajad Akhtar of the People’s Rights Movement; “Privatisation, neoliberal agenda and fight-back” with Rasul Bukhash Paleejo of Awami Tehrik (the People’s Movement); and “Socialism as an alternative”, hosted by the National Trade Union Federation with Tariq, Abid Hassan Minto of the National Workers Party and Masoor Karim from the Pakistan Communist Party. A seminar on the peasants’ struggle, hosted by the Pakistan Peasant Coordination Committee, gathered together two generations of peasant leaders, and a seminar titled “Falsification of Soviet history” was addressed by Dr Mark Goloviznin from Russia. Bring Back "Patterns Based Evidence"